Japanese framed woodblock print by Nakayama Tadashi (1927-2014) of a stylized abstract horse with butterfly wings against a deep red ground. Signed in pencil, number 62/85. Charming Japanese kanban (shop sign) hand carved from solid carved Keyaki hardwood with gold gilt lettering. 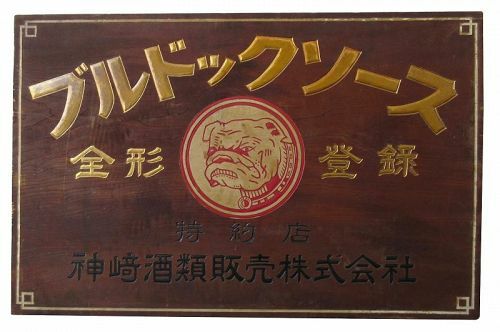 Carved with the image of a snarling bulldog in red lacquer and beige pigments. Shop sign for Bulldog sauce shop. Unusual Japanese gyosho bako tansu (merchant's chest). 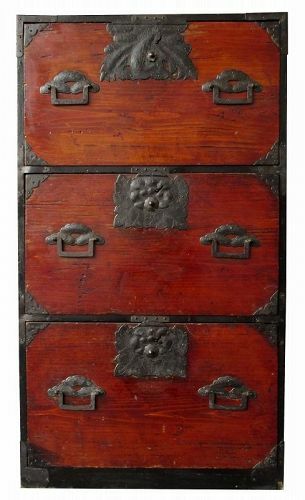 With original red lacquer finish, this large piece holds three very deep drawers, each with squared kakute iron pulls on stylized pine tree mounts. 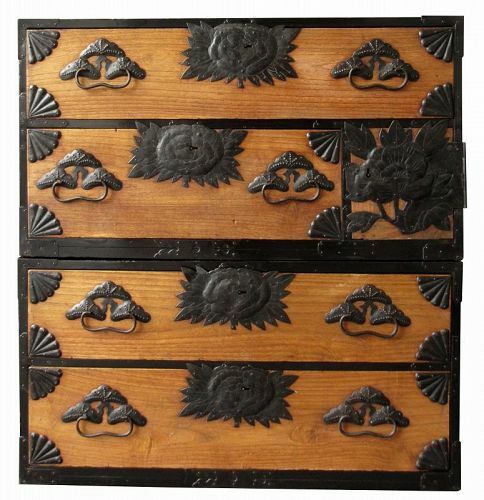 The top drawer features a large central lock with flying crane motif, while the lower drawers feature chrysanthemum locks. The sides of the tansu also have two handles for traveling. 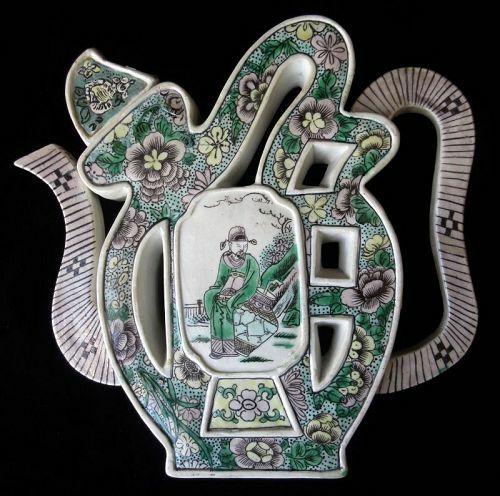 A Chinese porcelain puzzle tea pot with famille verte color palette motifs of flowers on flecked enamel ground. The teapot is in the shape of the Chinese character "fu" meaning "good fortune". The piece is hand-painted in enamel with the image of a court official and vase on one side, and an attendant holding a flower on the reverse side. Old restoration. 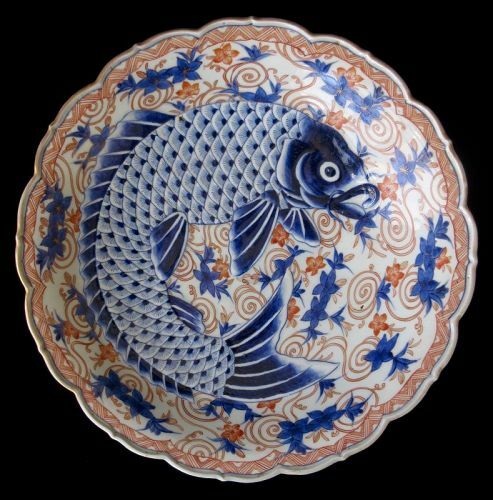 Japanese Imari ware porcelain charger with the image of a large koi fish in blue cobalt underglaze, with red and blue ground of scrolls, plum blossoms, the plate with fluted foliate petal edges, the underside with blue floral motifs and bands. The underside has a blue marking. A rare example of a Hachigane with Karuta Tatami armor. The munition armor has a double arrow crest and its helmet is decorated with kagona hair. Complete with 5 hon plate kote, manchira under armor, haidate, and suneate mounted on a metal stand. Comes with a hitsu box and wooden lacquer platform base. 18th century Japanese Akoda Nari armor with swallow tail meadate of gilt brass. Complete with a 3-hon plate kote, sode, nara mempo, suneate, and the Iyo haidate is unusual in form and construction. The kiritsuke Iyozane dou with bear hair trims, gold lamellar, dark brown lacquer, and blue silk cords. The armor is mounted on a hitsu box with painted platform and steel stand for the suneate. 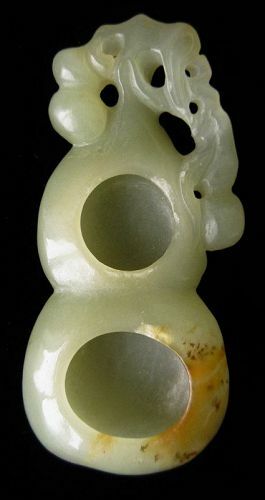 Chinese hard stone brush washer carved into a gourd bottle shape, with two separate pockets for brush washing, the top carved with smaller gourds and spiraling vines, the bottom carved smooth. The stone is light green with orange areas. 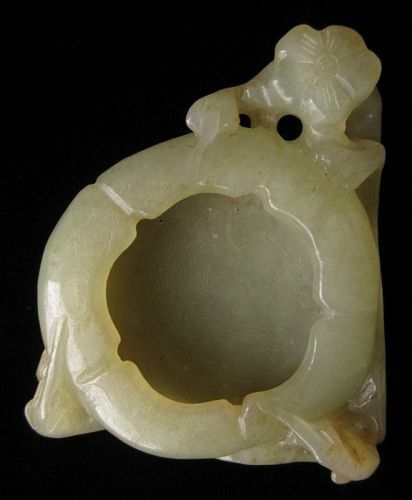 Chinese hard stone brush washer in the form of a flattened flower pod, edged with scrolling vines and flowers.